No matter where you live or what type of transportation you prefer, you’ve been a pedestrian at some point in your life. You may have walked to school as a kid. You may walk to work or the grocery store now. If you’ve made it this far in your life without being injured in a pedestrian-car accident, count yourself lucky. In the same year, another 76,000 were injured. In accidents with cars, pedestrians are extremely vulnerable. They don’t have metal surrounding them or seat belts, air bags, or other safety features protecting them. An accident can cause serious injuries and can even be fatal. Most of these accidents occur in urban areas, at non-intersections, and at night. Follow the rules of the road and obey all signs and signals. If there isn’t a sidewalk, walk facing traffic (the cars will be coming toward you). Pay attention at all times. This may mean not talking on the phone, texting, or using headphones. If there isn’t a crosswalk, cross the street in a well-lit area. Make eye contact with drivers to ensure that they see you. Wear bright, reflective clothing at night to help drivers see you. 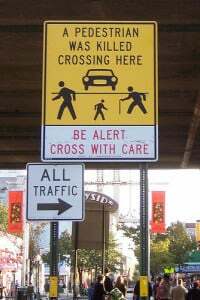 By paying attention and following the instructions above, you can reduce your chances of being in a pedestrian-auto accident. Unfortunately, there is no way to guarantee that you’ll never be in this type of accident (short of never walking anywhere). Some drivers are distracted by their phones or even drunk—and all the preparation in the world won’t make up for someone’s recklessness. If you’ve been hit by a driver, get medical attention, then call an experienced Everett, WA personal injury lawyer as soon as possible. An attorney can help you understand your legal options.